Valentine’s Day is just around the corner, sweethearts! We’re getting ready for the holiday the way we always do—by digging through our inbox. 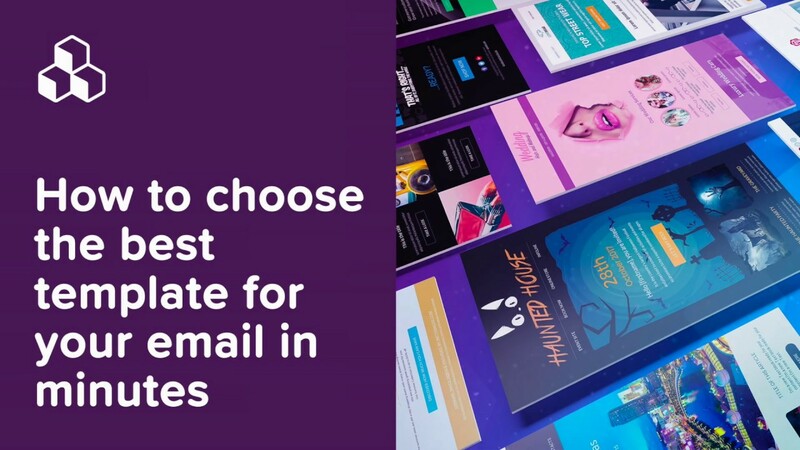 😍 And the Valentine’s Day email designs we’ve spotted are totally swoon-worthy. Here are 11 of our favorites, along with design tips for building your own. 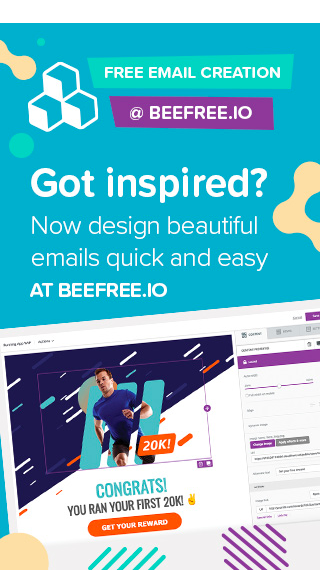 (If you’re in a time crunch, remember you can use a free trial of BEE Pro to customize a ready-to-use Valentine’s Day email template in a jiffy). Subject: We love the way you love! 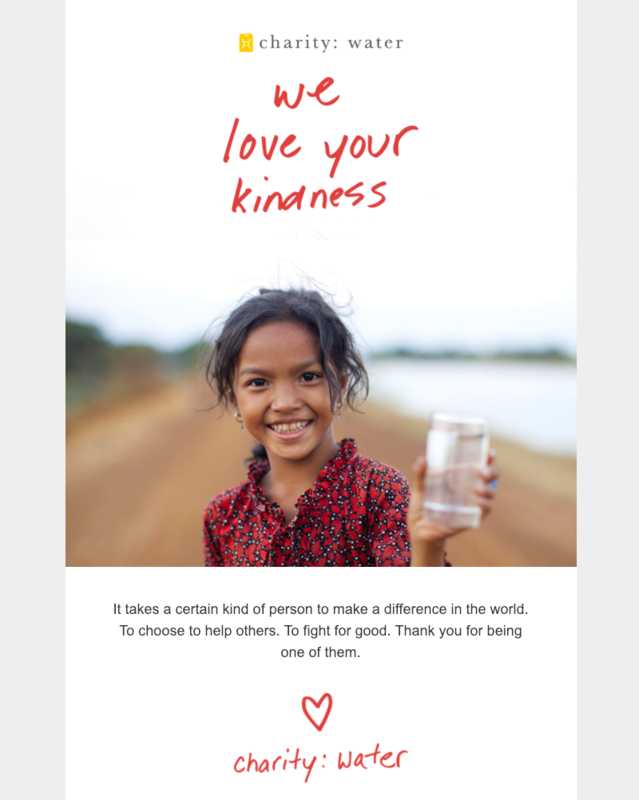 This is the opening GIF in Charity: Water’s lovely email. This is a special kind of Valentine—one with no call-to-action. 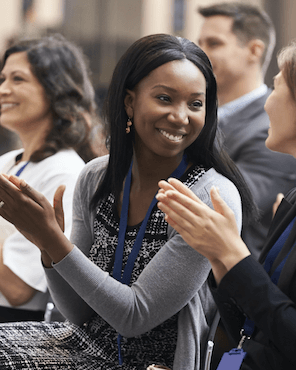 Instead, its message is simply “thank you,” which can go a long way in building brand trust with your audience. And with only a few lines of text, the message looks elegant and only takes a moment to read. From the playful subject line to the custom CTA button, this Valentine email from Care/of is a stunner. 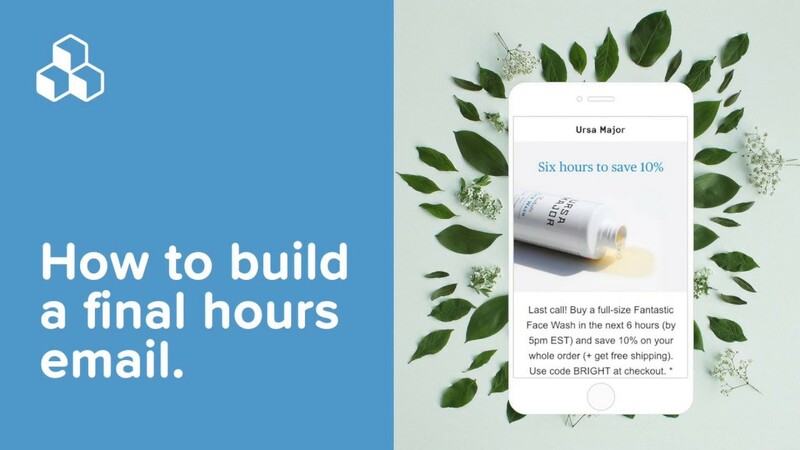 Whip up a message like this in no time using BEE’s background image feature—you can upload your product image and customize your own live text and button over top. Doesn’t this email just feel sort of… soothing? That’s thanks to the ample padding and white space used throughout, plus the gorgeous photography. 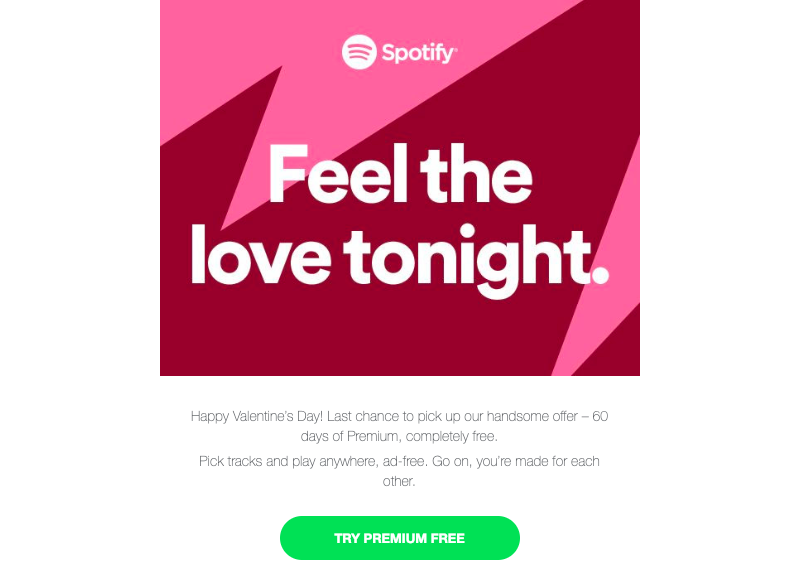 And it’s notably light on the traditional red-and-pink Valentine’s Day color scheme, showing us that even black-and-white emails can be romantic and effective. Okay, we have to give Chubbies a shoutout for the creativity. 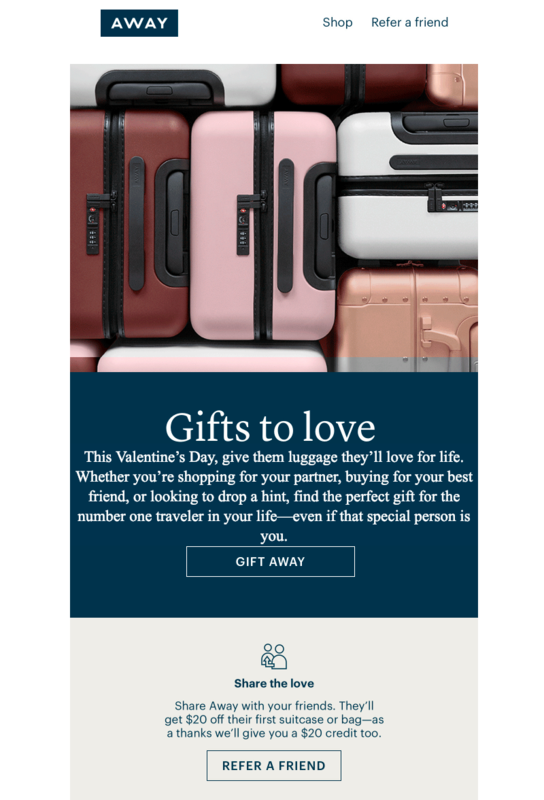 This Valentine’s Day campaign encourages readers to give their significant other or a friend a hint about what they want for V-day. 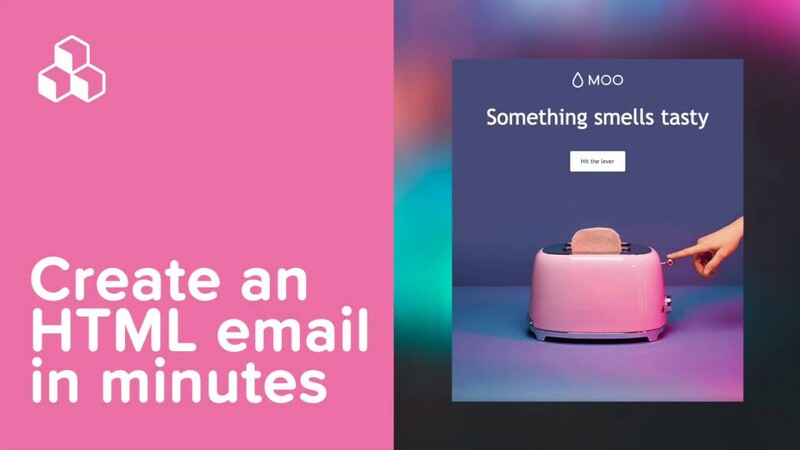 Click on the linked text and you get taken to a landing page where you can fill out a form to send your target recipient details about what might be on your wishlist. How sweet is that? Here’s another creative, unexpected Valentine’s Day email. In this one, Nisolo’s customer service department encourages “love notes” from customers and reminds them “We’ll be here for you” (using the lyrics to “Every Breath You Take” as inspiration). 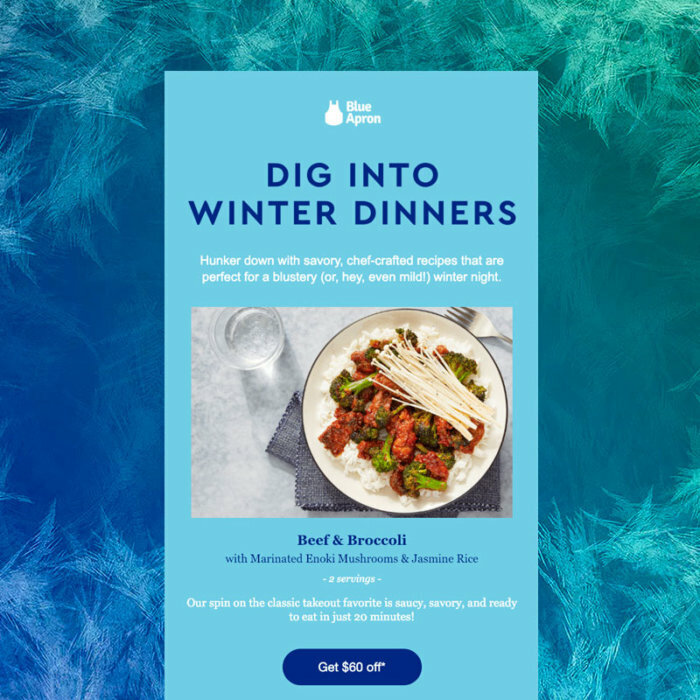 It’s fun, it’s playful, it’s simple, and it’s another example of a way to leverage brand trust this holiday. Check out the photo grid in Madewell’s second module. We’ve been spotting this design move frequently. The sleek look is achieved by using images that are exactly the same size, by skipping text, and by applying a slim border or padding between each one. And by choosing products that all fall into the same color range, the grid looks even more modern and cohesive. Try it out! Subject: Make SCENTS of love this valentine’s day. Malin+Goetz always sends bold, beautiful emails, and this Valentine’s Day number is no exception. The deep blue brand color pops against the white background, and because text is so minimal, it works centered. (Got a lot of text? We suggest left-adjusting). 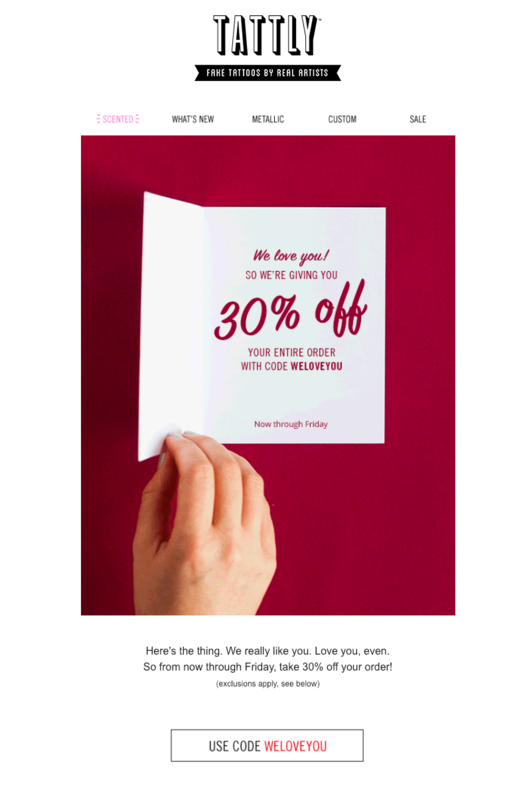 Subject: We Love You So Much, We’re Having a Sale! This is the opening GIF in Tattly’s loving Valentine. Just like Charity:Water and Nisolo, Tattly is wishing readers a happy Valentine’s Day with a we-love-you promo. The GIF is sweet, and it stands out all the more because Tattly lets it shine (no distracting/competing images or secondary content here)! Subject: Now Craving: Pink Lips for Valentine’s Day. 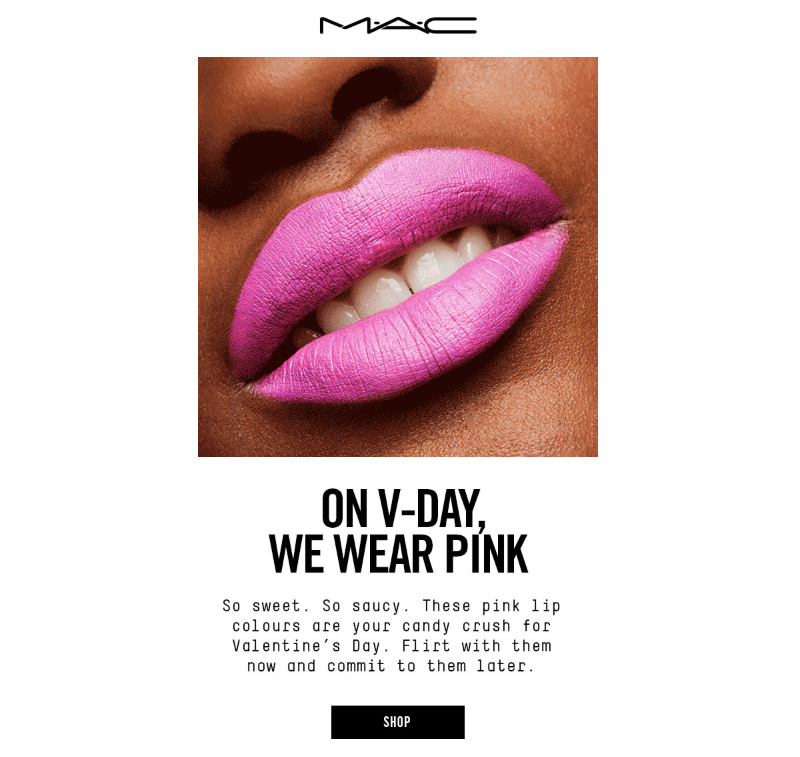 Another GIF-forward email, this time from cosmetics brand MAC. And it’s another example of super simple messaging. There’s not even a promotion or deal here; just a nudge to buy. 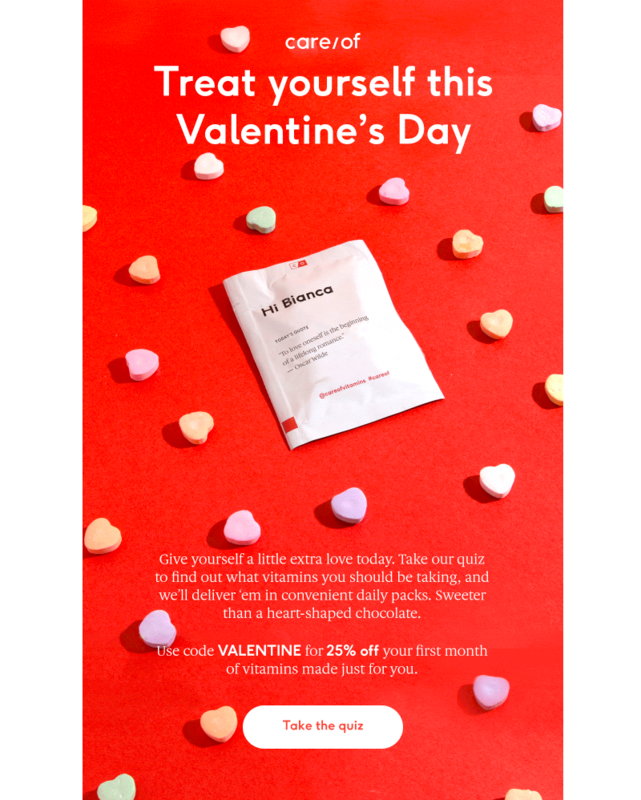 Are you ready to make your own beauty of a Valentine’s Day email design? 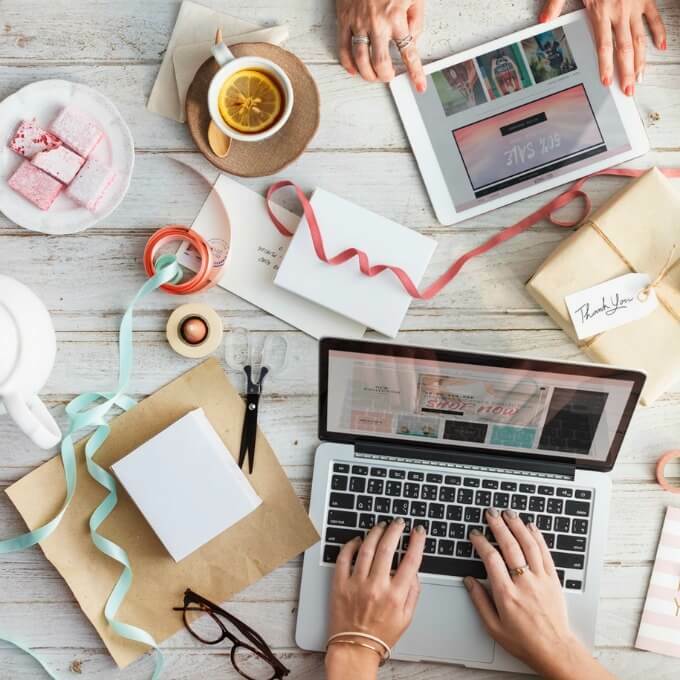 Treat readers with a surprise on V-day and show your appreciation for their love, whether you choose to just say thanks, send a promo, or reveal a new product. For speedy designing or simply to get a head start, check out BEE’s Valentine’s Day email template. We hope it helps you feel the love!